WASHINGTON — The Justice Department is investigating the Internal Revenue Service for targeting tea party groups for extra scrutiny when they applied for tax exempt status, Attorney General Eric Holder said Tuesday, widening a probe that includes investigations by three committees in Congress. Ineffective management at the IRS allowed agents to improperly target tea party groups for more than 18 months, concluded one investigation, by the Treasury inspector general for tax administration. The inspector general’s report, released Tuesday, lays much of the blame on IRS supervisors in Washington who oversaw a group of specialists in Cincinnati who screened applications for tax exempt status. The report does not indicate that Washington initiated the targeting of conservative groups. But it does say a top supervisor in Washington did not adequately supervise agents in the field even after she learned the agents were acting improperly. Holder said he ordered the FBI to investigate Friday — the day the IRS publicly acknowledged that it had singled out conservative groups. Three congressional committees already are investigating the IRS for singling out tea party and other conservative groups during the 2010 congressional elections and the 2012 presidential election. But Holder’s announcement takes the matter to another level, if investigators are able to prove that laws were broken. 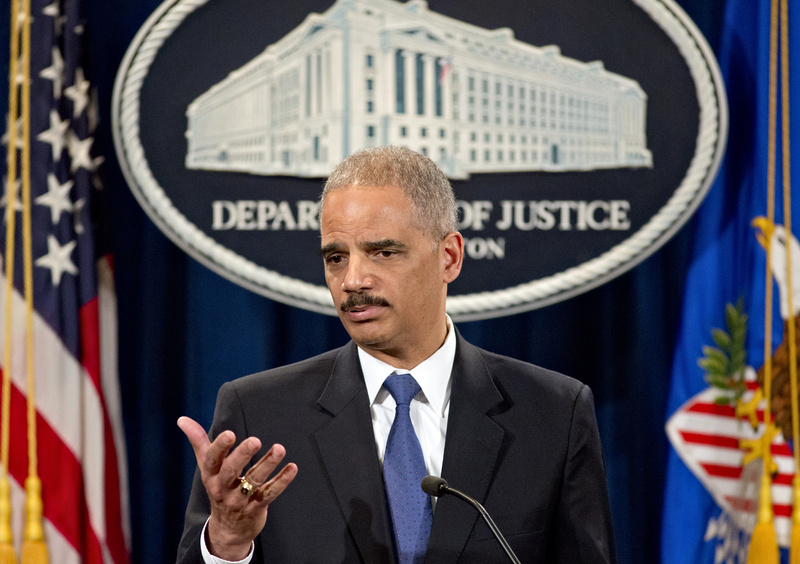 Holder said he wasn’t sure which laws may have been broken. The agency started targeting groups with “Tea Party,” ”Patriots” or “9/12 Project” in their applications for tax exempt status in March 2010, the inspector general’s report said. By August 2010, it was part of the written criteria used to flag groups for additional scrutiny. Lois Lerner, who heads the IRS division that oversees tax exempt organizations, had been briefed on the matter in June 2011. She ordered the initial tea party criteria to be scrapped but it later evolved to include groups that promoted the Constitution and the Bill of Rights. IRS agents were trying to determine whether the political activities of such groups disqualified them for tax-exempt status. These groups were claiming tax-exempt status as organizations promoting social welfare. Unlike other charitable groups, they can engage in political activity. But politics cannot be their primary mission. “The criteria developed by the Determinations Unit gives the appearance that the IRS is not impartial in conducting its mission,” the report said. In all, IRS agents identified 296 applications for additional, sometimes burdensome scrutiny. Ninety-one of them should not have been targeted because they did not indicate they were engaged in significant political activities, investigators concluded. Of the groups that were not engaged in significant political activities, 17 were tea party, patriot or 9/12 groups, the report said. As of December, the delays averaged 574 days, which probably made donors reluctant to contribute, the report said. No group has had their application denied, though about half are still waiting, the IRS said. Obama said he is ordering Treasury Secretary Jacob Lew to implement all of the inspector general’s recommendations to improve oversight at the IRS. “But regardless of how this conduct was allowed to take place, the bottom line is, it was wrong,” Obama said. The practice of targeting conservative groups ended in May 2012, the report said. “It is also important to understand that the group of centralized cases included organizations of all political views,” the statement said. The IRS has said the improper reviews were limited to a Cincinnati office where a special team was assembled to screen them. The inspector general’s report does not contradict the agency on this assertion. However, documents obtained by The Associated Press suggest the targeting of conservative groups could be more widespread. Documents sent from the IRS to tea party groups show that IRS offices in California and Washington, D.C., also sought extensive information from tea party groups who requested tax-exempt status. In letters provided by the American Center for Law and Justice, which represents 27 tea party groups that have sought tax exempt status, IRS officials from two cities in California — El Monte and Laguna Nigel — as well as officials in Washington, D.C., and Cincinnati contacted groups seeking extensive information. The law center’s chief counsel, Jay Sekulow, said he was astonished the IRS said activity was limited to Cincinnati. “To me, that was what was mind-boggling, they tried to create a narrative,” he said. On Monday, the IRS said acting IRS Commissioner Steven Miller was first informed on May, 3, 2012, that applications for tax-exempt status by tea party groups were inappropriately singled out for extra scrutiny. At least twice after the briefing, Miller wrote letters to members of Congress to explain the process of reviewing applications for tax-exempt status without disclosing that tea party groups had been targeted. On July 25, 2012, Miller testified before the House Ways and Means oversight subcommittee but again did not mention the additional scrutiny — despite being asked about it. On Tuesday, the IRS said, “While flaws in our process were corrected last year based on our own review, we only recently discussed this publicly as there had been a concurrent ongoing (inspector general) audit of the situation. There was no intent to hide this issue, but rather we waited until (the inspector general) completed their fact finding, made recommendations, and we reviewed their findings. Miller was a deputy commissioner at the time. He became acting commissioner in November, after Commissioner Douglas Shulman completed his five-year term. Shulman had been appointed by President George W. Bush. Miller is scheduled to testify before the House Ways and Means Committee at a hearing Friday.